This project, undertaken by the University of Edinburgh, aims to investigate the potential that digital tools hold for building community engagement and enhancing the transition of further education (FE) students to higher education (HE). Principal investigators: Dawn Smith (Community Engagement Developer) and Abby Shovlin (Academic Induction Planner), Student Experience Project (SEP). Total award from AMOSSHE: £1,100. The ‘emotional journey’ of further to higher education transitions is well documented in research literature. Studies show that many further education students are often poorly prepared for the realities of university level study, because these students typically have a limited understanding of the new system, or of the standards expected of them and can therefore find transitions to higher education deeply unsettling. This project aims to investigate how a University of Edinburgh Massive Open Online Course (MOOC) in Critical Thinking can be used as a pre-arrival resource that allows college students to proactively prepare for this transition. The project team hopes that this pre-arrival learning experience will effectively bridge the gap between further and higher education learning, and thereby help to minimise the roller-coaster of emotions that further education students experience on their transition journeys. This project will include the delivery of a MOOC in a local further education college. AMOSSHE colleagues will directly benefit from the project’s literature review and the research findings from the pilot MOOC. This project will make a substantial contribution to AMOSSHE’s knowledge base of digital practice in the transition to higher education. Help students to proactively prepare for the transition from further to higher education. Build stronger links between the university and local further education colleges. Encourage university academic staff to consider a wider audience when developing MOOCs. To increase student empowerment by allowing further education students an opportunity to sample university learning before beginning their undergraduate programme. To support further education staff to better prepare their students for the challenges of university study. Increase digital skills of both higher and further education students. Build the graduate attributes and skills portfolio of higher education students. Increase the community uptake of MOOCs. Lay the foundation of an enhanced ‘transition’ from college to university route (aligning Access courses / HNC with the first year of university). Establish an AMOSSHE best practice model for digital practice in community engagement and transitions to higher education. This project will build a literature review on the use of digital tools in community engagement and transitions to higher education. Its primary research methodology is that of action research, because this approach facilitates engagement with people in collaborative relationships, opening new ‘communicative spaces’ in which dialogue and development can flourish. The student voice is a key part of this project as the experience will be evaluated through focus groups, student forum posts and one to one semi-structured interviews with both Edinburgh College and University of Edinburgh students. The project will therefore research the change that it wishes to create, thereby effectively informing future developments in the field of digital practice in community engagement and transitions to higher education. The MOOC will not be used merely as a standalone transitions resource, because it will be delivered in a live classroom-style setting by current University of Edinburgh students. These university students will act as Student Community Tutors to support the college students’ learning in an online forum, and will also travel to Edinburgh College and assist the project leaders in the delivery of the live MOOC sessions. One of these MOOC sessions will be held at the University of Edinburgh so that college students have the opportunity to take part in a university learning experience on campus. In the final session of the five week MOOC, college students will be able to complete the course assessment and gain a Statement of Accomplishment from the University of Edinburgh. Literature review and benchmarking of current best practice in the use of digital tools in community engagement and transitions to higher education. Student evaluation of the MOOC: focus groups, one to one semi-structured interviews and forum posts. 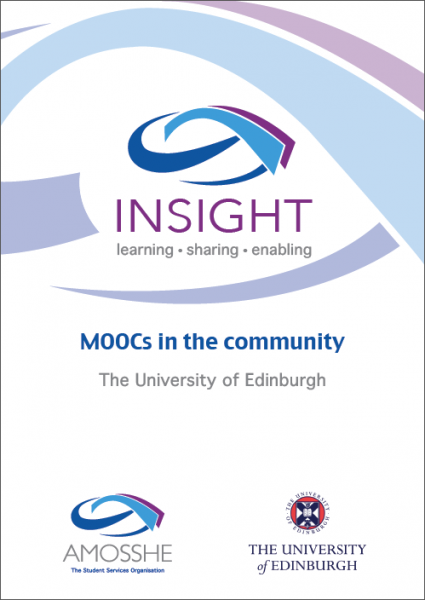 MOOC Statements of Accomplishment for Edinburgh College students. Community engagement experience for University of Edinburgh students. A film of the project that focuses on the student and community voice - the student intern will capture footage and edit the final product. Research made available to AMOSSHE partners interested in further developing their own digital tools for engaging with further education partners and the community more broadly. Putting case studies on the Institute for Academic Development and Student Experience Project website. An internal report for both Edinburgh College and University of Edinburgh.